The Canon EOS 30D brings proven EOS technology to a higher level, giving photographers an unbeatable photographic experience. The EOS 30D incorporates a host of features with Canon's highly acclaimed 8.2 megapixel CMOS sensor and DIGIC II Image Processor. The EOS 30D includes enhanced operational features such as a 2.5 inch LCD monitor, true spot metering, a durable shutter mechanism and Canon's Picture Style feature, all in an sturdy, magnesium-clad body. With all these new features the EOS 30D is truly perfection, refined. Canon's large-area CMOS (complementary metal oxide semiconductor) sensor captures images with exceptional clarity and tonal range, and offers the most pixels in its class. This APS-C size sensor (22.5 x 15.0mm) has the same 3:2 ratio as film cameras, enabling an effective angle of view that is 1.6x the normal EF Lens focal length. In addition, the EOS 30D has an extensive ISO range (from 100 to 1600 plus ISO 3200 in extended mode), which is selectable in 1/3-stop increments. The DIGIC II Image Processor was designed specifically for Canon digital SLRs and enhances every aspect of image capture. Information captured by the CMOS sensor is processed and assembled into images of exceptional quality. With the DIGIC II Image Processor on board, photographers can expect natural color reproduction, precise white balance in any number of lighting situations and unparalleled clarity. The DIGIC II Image Processor employs sophisticated signal processing algorithms and works at greater speeds, all while consuming less energy. The EOS 30D allows users to specify high-speed 5 fps or a low-speed 3 fps continuous shooting for more controlled shooting and/or to save space on the CF card. And it can capture up to 30 JPEG and 11 RAW (or 9 RAW + JPEG) files in one burst. Whether it's the 0.15-second startup time, the high-speed mirror drive, the nearly instant 65-millisecond shutter release lag time or the predictive AF focusing at speeds up to 5.0 frames per second, the EOS 30D will amaze and delight photographers who don't want to wait for their camera when they're ready to shoot. The EOS 30D has a brilliant 2.5 inch LCD monitor with approximately 230,000 pixels resolution. This monitor not only displays more information, it can also be viewed at a greater angle (170°) than many conventional LCD monitors. The full-featured shot information screen not only provides an RGB histogram, it can display the AF frame used. Furthermore, Magnification zooms to the focus point rather than the center of the image to check exposure and critical focus. Menus are accessed at the touch of a button and feature larger text than previous models that is easier to read. Whether changing color parameters, setting up custom functions, organizing folders or setting white balance, the EOS 30D helps photographers get to their information quickly, so they never miss a shot. The EOS 30D incorporates Canon's Picture Style settings, which simulate the characteristics of different film styles, allowing photographers to customize their shooting to their personal taste or needs. These include Standard, for punchy, print-from-the-camera color, Portrait, for softer, more natural skin tones, Landscape, for vivid blues and greens and overall sharpness, and Neutral, Faithful and Monochrome, which can be customized to emulate color filters with black and white film. The EOS 30D has a solid, substantial feel that complements its compact dimensions. The camera body is constructed of magnesium-alloy, known for its lightweight and ultra-rigid strength. It has an improved high-speed and durable shutter unit, designed to perform flawlessly and reaching a top shutter speed of 1/8000 second with a remarkable 100,000-cycle shutter life. The EOS 30D has a spot metering function that meters roughly 3.5% of the center of the image. This metering function, in addition to Canon's impressive evaluative, center-weighted average and partial metering modes, gives the photographer even more choices for custom-tailored shooting. The EOS 30D lets you print beautiful photos with minimum time and effort - directly from the camera. It's compatible with Canon's SELPHY Compact Photo Printers, desktop PIXMA Photo Printers, and even third-party PictBridge-compatible printers. The EOS 30D comes bundled with the Canon EOS Digital Solution Disk (Version 12.0) , which features powerful software programs designed to extend the EOS experience to the computer. Each application is designed to perfectly captured images, and streamline your digital workflow. Digital Photo Professional (Version 2.1) provides easy-to-use RAW conversion tools, including high-speed RAW image processing, high-speed previewing for real-time image adjustment and support for sRGB, Adobe RGB and Wide Gamut RGB color spaces. Since it's CMS (Color Management System) compatible, Digital Photo Professional allows for easy image layout and printing in Adobe RGB in conjunction with Easy-PhotoPrint and PictBridge printers. Canon's EOS Utility software (version 1.0) handles the connection between the camera and computer, whenever they're connected via USB. It allows remote controlled shooting from the computer, handles downloading of images from the camera to the computer, and allows seamless linking to either Canon's ZoomBrowser/ImageBrowser or Digital Photo Professional software once images have been copied to the hard drive. Furthermore, it's used to upload settings back into a USB-connected camera, from Picture Style files to the user-named file. There's also a folder monitor - ideal to check and display images being transmitted by the optional WFT-E1A wireless transmitter. Canon's ZoomBrowser EX for Windows and ImageBrowser for Mac OS X are the easy, user-friendly options for viewing and editing of JPEG and even RAW image files. Both allow viewing of numerous types of images including finished TIFF and BMP files. Both also have a variety of search options for finding images, allow re-naming of single images or batches of files, and offer a variety of options for printing without using a separate image-editing program. The EOS 30D is compatible with all Canon lenses in the EF lineup, ranging from ultra-wide angle to super telephoto lenses, and including Canon's EF-S series lenses, manufactured specifically for Canon's APS-C sized digital sensor. Canon lenses employ advanced optical expertise and micron-precision engineering to deliver unprecedented performance in all facets of the photographic process. Aspherical optics and fluorite elements, for example, are featured in the universally acclaimed L Series lenses, and Canon's Image Stabilizer technology in select lenses minimizes the effect of camera shake. Through Canon lenses, photographers can truly maximize the quality and liberating performance of the EOS 30D. The EOS 30D features the acclaimed E-TTL II flash metering system introduced with the EOS-1D Mark II. Whether using its flush-mounted integrated flash, or any of the flashes in the EX Speedlite line, E-TTL II provides reliable flash output through numerous exposures. In addition to Canon's EF lenses and Speedlite flashes, many other accessories are designed by Canon to work perfectly with the EOS 30D. The Battery Grip BG-E2 adds a vertical shutter release, and is compatible with up to two of Canon's BP-511A Lithium-ion battery packs for increased shooting capacity, or alternatively a set of six AA-size batteries, for greater convenience when traveling. Canon's Semi Hard Case EH17-L can accommodate the EOS 30D with a small zoom lens (e.g. EF-S 18-55mm). 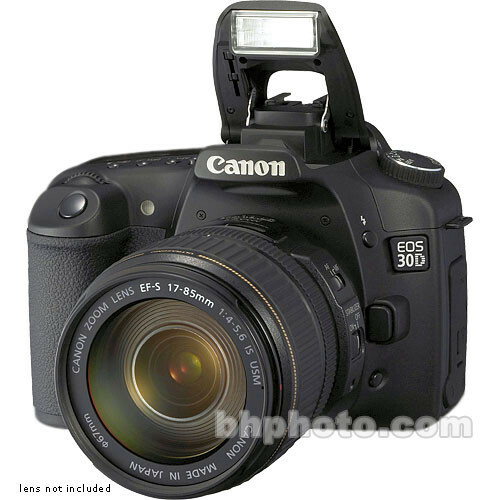 The EOS 30 D is also Compatible with the Canon DVK-E2 Data Verification Kit which can verify whether or not a photo is an untouched original and the WFT-E1A Wireless File Transmitter which allows photographers to transmit images from their cameras directly to a computer over a Wireless network. EOS 30D Digital Camera (Camera Body) is rated 4.8 out of 5 by 78. Rated 5 out of 5 by Wisenheimer from Great Camera that is Very user friendly!!! This is my first SLR camera. I replaced a kodak easy share digital camera because the indoor pics with low light were terrible. The 30d has surpassed my expectations. It has been easy & fun to learn with. The indoor shots at some of the zoo's & museum's that we have went to are just terrific. I am very satisfied & would definitely buy this camera again. I have so much to learn about taking real photos, I'm glad that I will have this camera to learn with. Expertise: Beginner Problems Encountered: Very addictive to play with. Must have understanding spouse!!! Previous Equivalent Item Owned: Kodak easyshare 5 megabite digital. Rated 5 out of 5 by allan everett from I TRULY LOVE THIS CAMERA...SORRY SONY!! THIS CAMERA IS AN AWESOME HEAVY DUTY MACHINE. THE BUILD QUALITY IS ONE OF THE MAIN REASONS FOR MY PURCHASE BESIDES THE EXCELLENT LOW LIGHT, HIGH iso PERFORMANCE!! THE CANON FLASH UNITS GIVE EXCELLENT LIGHT PERFORMANCE AS WELL. 8.2 MP IS WELL ENOUGH FOR MY SHOOTING NEEDS AND THE RAW FORMAT PRODUCES LARGE TIFF FILE AS WELL. THE BATTERY LIFE IS AMAZING; I THOUGHT IT WOULD NEVER RUN OUT!! BEFORE THE 30D I HAD A KM-7D AND THAT DIED ON ME...I DONT TRUST THE SONY CAMERAS AND IM SO GLAD THAT I BROUGHT THE CANON.. THE PICTURE STYLES IS A GREAT FEATURE AS WELL...GET THIS CAMERA, YOU WILL NOT REGRET IT, BUT I REGRET NO GETTING IT IN THE FIRST PLACE! Rated 5 out of 5 by Anonymous from Best semi-pro DSLR on market Yes I know it is a little bit outdated. And yes there are many new cameras on market with bigger resolution but I find this camera price/performance winner. For this price you can not buy better body. Commands are intuitive. this camera has a very good per pixel sharpness. Images are good even at high ISO settings. Excellent battery life. I use it every day mainly for portraits and landscape. Rated 4 out of 5 by Anonymous from Easy, high quality photos This camera is great. Reliable, lightweight, great photo quality for personal work. This is a really good choice for someone who has an interest in photography to the extent that they want an SLR as opposed to a point-and-shoot digital camera. Obviously if you're a professional you want something a little more top of the line at this point, but it's a really good way to get yourself acquainted with digital photography in a fun and easy fashion. Rated 5 out of 5 by africaphotos from sturdy and so far very reliable I use this to shoot some photojournalism and portraiture. I must say that the camera reacts swiftly and is very easy to use. Also, I accidently gave it a pretty hard bang against a door frame and there was barely a scratch and it kept on working fine. It is sturdy and very well built and I am very happy with the purchase. I also like the review screen as it is much larger and sharper than the one on the 10D which I had before. My only dislike (and it is very minor) is that you have a second on position in order to be able to use it fully in manual mode. In other words, to switch from say, shutter priority to manual, you have to make sure your power setting is in the correct mode, or it won't work. But again, this is minor and I am getting used to it.